Unfortunately time constraints (i.e my day job) keep getting in the way of me updating this site so all Ive been able to do so far for the Norwich City Nickname page is a very basic bit of background. 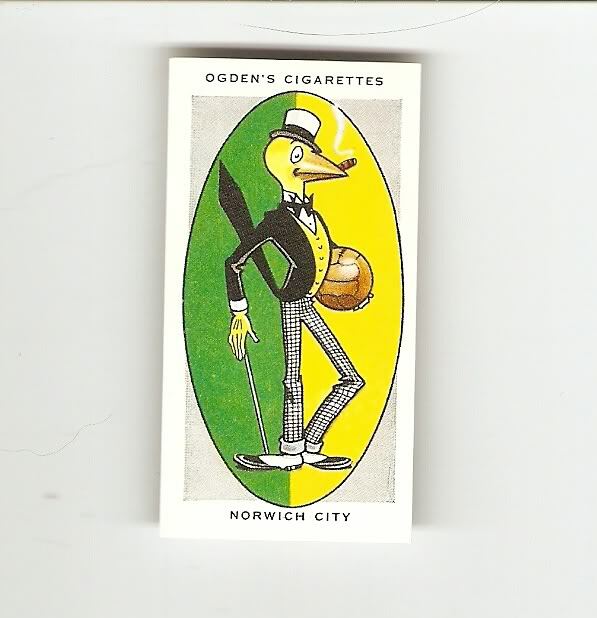 Ive shown below a football cigarette card from the Ogdens AFC Nicknames series that shows a caricature of the most commonly known nickname for Norwich City, The Canaries. "Norfolk is world-famed for its canaries, and it was on this account that Norwich City, which is the only League club in the county, has been dubbed the "Canaries". To lend colour to the name, the ground (which is outstanding owing to the dwelling house which at one end stands within a few yards of the goal) is called "The Nest". In keeping with the name the team plays in yellow and green jerseys. In its isolation Norwich City commands good gates for a Third Division club,and in season 1932-33 they made a fine attempt to unfurl the Second Division flag in Norfolk". So there you have it, Ogdens take on the Canaries Nickname, Imsure though I can add a bit more to that so I will be coming back to this page to expand on this a bit more ! !